Ameji ON, PA Abdu, L Sa’idu & M Isa-Ochepa, Knowledge of poultry diseases, biosecurity and husbandry practices among stakeholders in poultry production in Kogi State, Nigeria, Vol. 10, No. 2, 2012. Asif, Mohammad, Antimicrobial Potential of Azadirachta indica Against Pathogenic Bacteria and Fungi. Vol. 1 No. 4 2012. Butler. Lorna Michael and Robert E. Mazur. Principles and processes for enhancing sustainable rural livelihoods: Collaborative learning in Uganda. Vol 14 No 6 tahun 2007. Chetry, Gopal Kumar Niroula and Lassaad Belbahri, Indigenous pest and disease management practices in traditional farming systems in north east India. April 2009. Chirau, Takunda J, Sipho Nkambule1, and Gift Mupambwa. Rural Livelihoods in Zimbabwe: Heterogeneity, Diversification and Vulnerability. Vol. 5 No 1. Jan 2014. Djukri, Karakter tanaman dan produksi umbi talas sebagai tanaman sela di bawah tegakan karet , Vol. 7, No. 3, 2006. Falk Ian et al, Community management of biosecurity: Overview of some indonesian studies, 2008. Garcıa, Victoria Reyes. Resilience of traditional knowledge systems: The case of agricultural knowledge in home gardens of the Iberian Peninsula. November 2014. Kiruba, S. et al. Ethnic storage strategies adopted by farmers of Tirunelveli district of Tamil Nadu, Southern Peninsular India, May 2008. Mahanty, Sango, Jane Gronow, Mike Nurse and Yam Malla. Reducing Poverty through Community Based Forest Management in Asia Journal of Forest and Livelihood. February, 2006. O, Osewa S. et al, Use of some Neglected and Underutilized Plant Species among Rural Dwellers in Akinyele Local Government Area of Oyo State, Desember 2013. Penaranda, Raquel Moreno & Henrik Egelyng. Organic agriculture as livelihood strategy: A case study in a rural community of Southern Brazil. 2008. Permana Raden Cecep Eka, Kearifan lokal tentang mitigasi bencana pada masyarakat baduy, Vol. 15, No. 1, 2011. 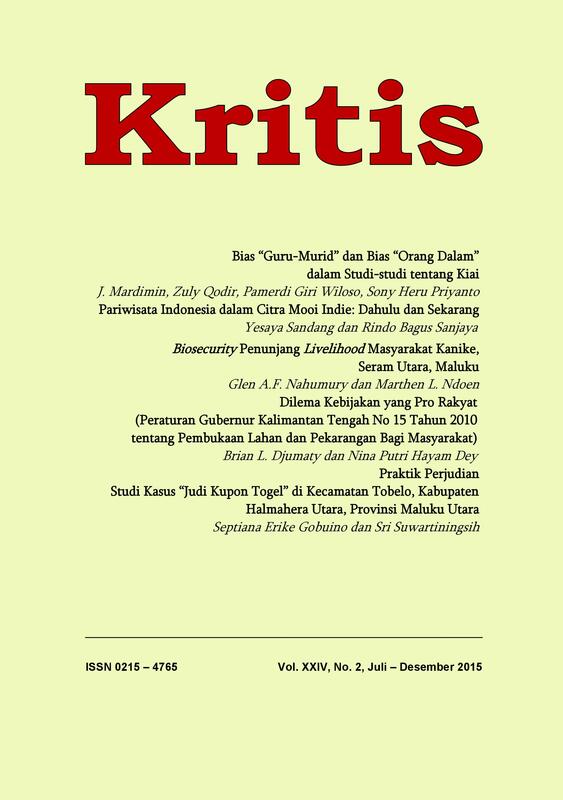 Raco,J R, 2010, Metode Penelitian Kualitatif: jenis, karakteristik, keunggulan. Jakarta : Grasindo. Sharratt, Mark & Abel Usoro, Understanding Knowledge-Sharing in Online Communities of Practice. 2003. Sudarmono, Pratiwi P. Biosecurity dalam Kedokteran dan Kesehatan, Vol. 3, No.1, 2015. Uprety, Yadav, dkk. Diversity of use and local knowledge of wild edible plant resources in Nepal, 2012. Warren D. M & B. Rajasekaran. Putting local knowledge to good use. 1993.